Though the processes and procedures involved in an eye doctor visit and exam are similar for everyone—your exam is unique to you and you alone. That’s because the process of examining your visual acuity (sharpness), visual ability, and then using different machines and procedures to examine your eyes, is as individual as a fingerprint. Over time, your vision and overall health changes. That, more than anything, is why there's a general procedure to follow during an eye exam, and why it’s important to visit your eye doctor. Without eye doctor visits, these critical changes in vision and eye health may go unnoticed. Beyond what you need to know going into an exam, know that visiting your eye doctor is a process you should repeat regularly to maintain eye health and ideal vision. You can expect an eye doctor visit to last about an hour or so, depending upon whether or not you’ll need to have your pupils dilated (opened up) with special drops to allow your eyecare professional to fully analyze the internal structure of the eye. Then you’ll undergo simple visual acuity tests designed to check your overall vision, near vision, and side vision. These tests may reveal vision errors that need correction; errors that usually direct your exam toward special equipment used to accurately determine your prescription. But expect even more out of your visit to the eye doctor—because correcting vision and maintaining good eye health do require additional, regularly-performed tests. Visiting your eye doctor regularly is the only reliable way to maintain healthy sight and possibly prevent mild to serious eye diseases. 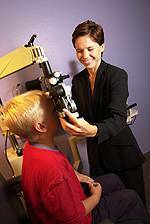 For children, teens, and adults of all ages, an eye doctor visit needs to happen regularly; at the minimum once every two years, and more frequently if you currently have eye disease, are at risk or have diabetes, or are approaching stages in life that put you at risk for age-related eye disease.